Normally I style this tank in a girly way. However, getting a bit on the cooler side, I've thrown my favourite jacket over the top and roughed it up a bit with black accessories and my skinny jeans. I also added some lace up wedges, to add to the rock look! 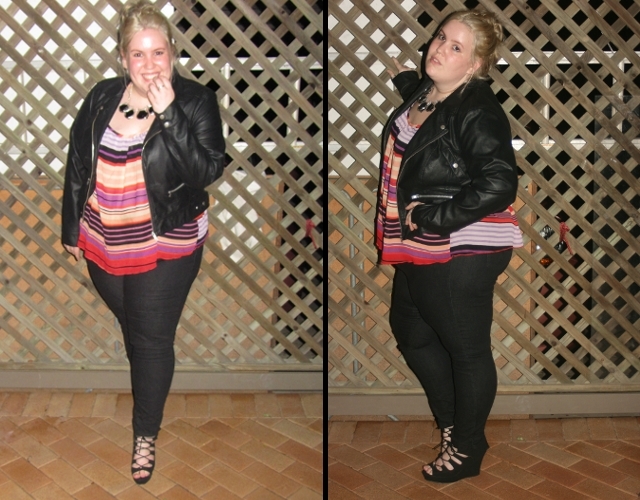 I love wedges, I'm really not a high-heel wearer (noticed all the flip-flops in my outfit shots yet???? ), but a wedge is the perfect in between! So there is my stripe shirt for the week! 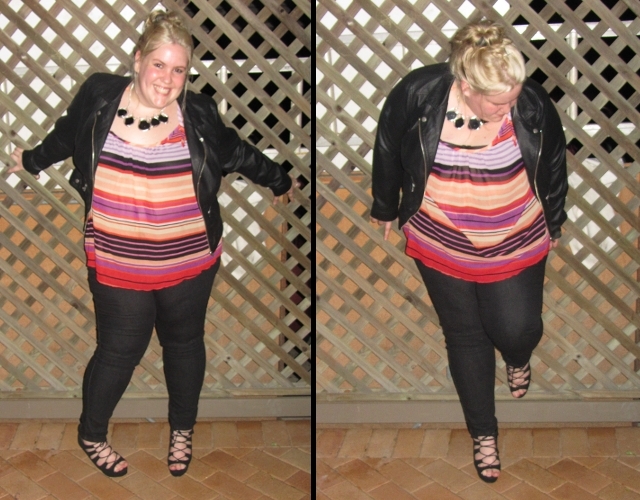 Make sure you check out the other Fatshion Faceoff girls as well to see how they styled this weeks item! So freaking adorable! I love how you rocked out your stripes, that's awesome. I like doing that too, with more girly things. Also, dying a bit over your necklace and wedges, they are so cool. :D Yay! lol I'd love to see your top!!! KILLER OUTFIT! Ahhh, I love it. Those wedges are so cute, I DIE. I love the pop of color from the top. Perfect! Thanks babe!! And the wedges are so comfy too!! This outfit is hot!! I love the shirt and necklace together. Liv, I love it you're hot and you're rocking it. awww thanks so much Trudie!! Love the floaty shirt and skinny jeans combo! love this outfit.. leather jackets are always a great piece! AND those shoes are AMAZING! Thanks Jill! I loooovvveee this jacket! So cute, love the striped shirt! Love, love, love! Really liking the rocky twist to these stripes...I might have to work this look myself!! You are working it, I love the attitude you are giving in the second picture haha. This is a great look and I love the leather jacket. Yay for wedged heels, I won't wear any other type of heel. Your looks are getting better & better Olivia! 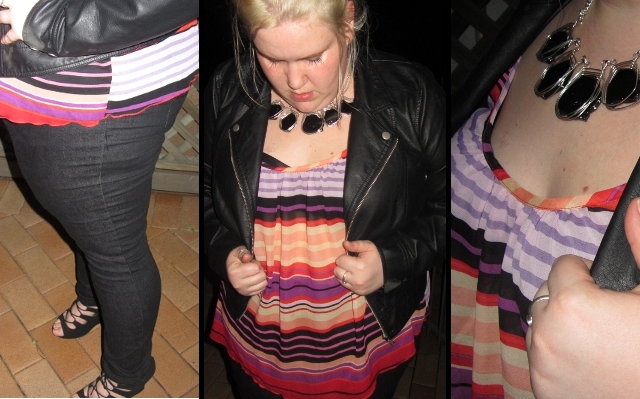 I LOVE the colours in your top & you look so rock chick wearing it with your jacket! Thanks Mica- I love this jacket! Nice! Love the whole outfit! You are awesome, like always. You make my day, every single time. hheeyyaa! I'm checking your blog out now! Hello hotty! I really love it when you wear grungier thinks, I don't know what it is, but you look fierce! My old one got out of hand and i had to start fresh! i missed you guys!! !by the way i didnt forget about and you look amazing in your outfit!!!! You've definately transformed this top! You look great!!! I agree with you about wedges. They are the perfect alternative to high heels!! Fab job!!!! Thanks babe! And wedges, OMG my saviours!